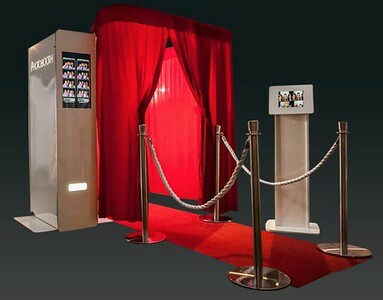 Our traditional enclosed photobooth comes with your very own attendant and an automated printing system. Images are printed in fully customised strips with one for your guests, and one for yourself. You've probably seen these around and they're very popular for birthdays, events and functions. The traditional booth has a 22" screen, is fully customisable and uses a Canon DSLR. Open and Retro styled booths are also available as well as extra time. We'll setup a studio and backdrop at your reception to take 'studio' style photos with a real photographer. We'll then print images on the spot for your guests to take home. You'll have your very own photographer who will prompt you to do funny, crazy and silly poses for the camera. We can fit larger groups of people as well as full length formal photos in front of the backdrop and most important of all, it's setup like a true studio shoot with larger variation for posing and composition. It's printed on 6x4" which is twice as large as the strips printed from the automated booths. Our studio booth usually takes about 20 min to setup and requires an area around 4x4m. We also need room for a table to fit an editing workstation and printer.